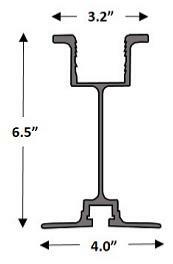 The 6½" Hi-Lite Style HL-Beam is a heavier beam than the A-Beam. It can bear somewhat more weight in use than the A-Beam. It also is designed with curls at the ends of all flanges to ensure proper gripping of clamps. The curls also act to provide a stronger flange edge, less apt to be damaged in use and thus providing greater longevity in the field. 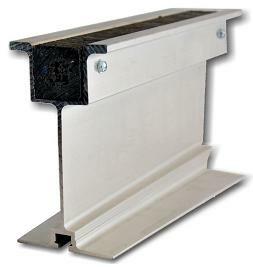 As are all GATEWAY beams and stringers, the Hi-Lite Style Beam contains a 2" x 2" plastic nailer strip which is formulated to provide nail gripping properties comparable to wood, and will not become soft in hot weather, nor brittle, nor crack in extreme cold. Plastic nailers are much more durable than wood and will withstand repeated use as plastic is apt to self-heal upon fastener removal. The Hi-Lite Style Beam has the standard T-Head Bolt slot in its base for fastening stringers, strongbacks or I-Beams with the standard easy-to-use self-locking A-Bolt. 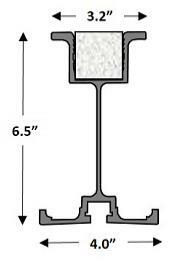 The 6½" aluma style aluminum A-Beam - 4" Base is a profile with a narrow 4" bottom flange, perfect for doubling up in 8" shoring-post saddles for extra stregnth. The beauty of this engineered profile is that it is not simply an A-Beam clone where 1" of bottom flange (and strength) is missing. The aluminum removed from the bottom flange width has been engineered back into the profile so that this shape CONFORMS to the industry standard, 6.5" A-Beam load chart. 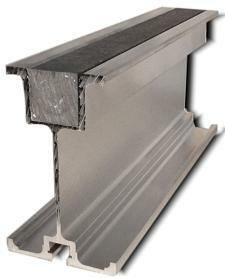 This product thus weighs the same as the standard A-Beam and is priced similarly. As with the standard A-Beam, this product contains a 2" x 2" plastic nailer strip which is formulated to provide nail gripping properties comparable to wood, and will not become soft in hot weather, nor brittle, nor crack in extreme cold. Plastic nailers are much more durable than wood and will withstand repeated use as plastic is apt to self-heal upon fastener removal. 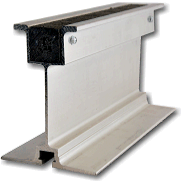 The A-Beam - 4" Base has a T-Head Bolt slot in its base for fastening stringers, strongbacks or I-Beams with the easy-to-use self-locking A-Bolt. The 6½" aluma style A-Beam - 4" Flat Base is also a profile with a narrow 4" flat-bottom flange, perfect for doubling up in 8" shoring-post saddles for extra stregnth. And again, the beauty of this engineered profile is that it is not simply an A-Beam clone where 1" of bottom flange (and strength) is missing. 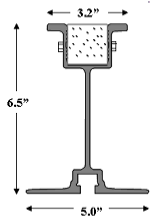 The aluminum removed from the bottom flange width has been engineered back into the profile so that this shape CONFORMS to the industry standard, 6.5" A-Beam load chart. This product thus also weighs the same as the standard A-Beam and is also priced similarly. The bottom flange has been left in its original geometry should the user wish to affix the flange by means other than standard clamping. 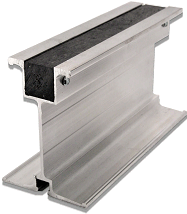 The 6½" aluma style aluminum A-Beam has been the workhorse of the industry for decades. Its strength and lightweight properties provide an optimal working combination. 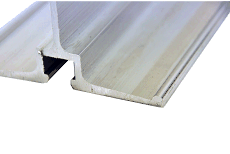 Aluminum minimizes the number of total horizontal and vertical members required on the job, compared to wood. Since it is lightweight compared to steel, the contractor realizes labor productivity through ease of use. The A-Beam contains a 2" x 2" plastic nailer strip which is formulated to provide nail gripping properties comparable to wood, and will not become soft in hot weather, nor brittle, nor crack in extreme cold. Plastic nailers are much more durable than wood and will withstand repeated use as plastic is apt to self-heal upon fastener removal. The A-Beam has a T-Head Bolt slot in its base for fastening stringers, strongbacks or I-Beams with the easy-to-use self-locking A-Bolt.